Finally we are back to eating something reasonable. Along with the shrimp that John marinated, I cut up a variety of vegetables – onions, carrots, celery, snow peas, garlic, ginger, poblano chile, and Brussels sprouts. I usually add cabbage but since we didn’t have any, Brussels sprouts would have to do. We also made some steamed white rice which I decorated with some black sesame seeds. 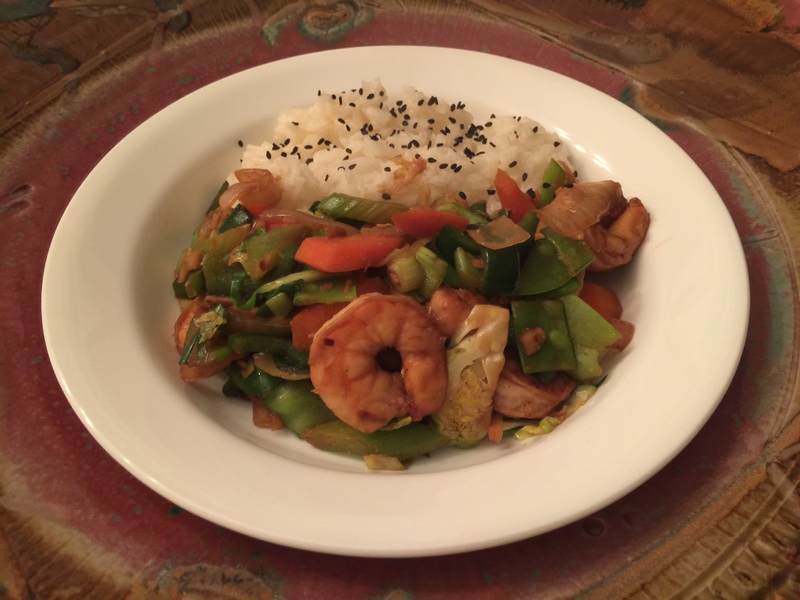 This entry was posted in pescatarian, rice, Shellfish, Vegetables and tagged brussels sprouts, carrots, Celery, garlic, ginger, green onions, Onions, rice, shrimp, snow peas. Bookmark the permalink.